U.S. equities are continuing to suffer from persistent and relentless selling pressure that has been a hallmark of October so far. The major indices dropping back into the red Monday morning, reversing nice gains seen at the open, making stocks to buy hard to find. 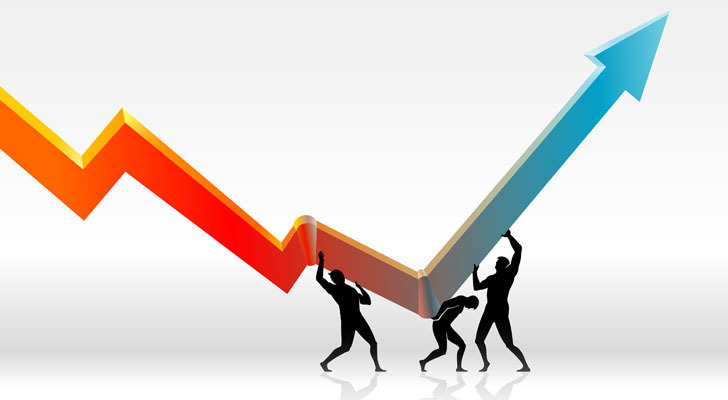 There is no specific catalyst for the intraday selloff, but a continuation of the diminishing appetite for risky assets amid worries over rising interest rates, ongoing trade tension, and political uncertainty heading into the mid-term elections in the United States next week. 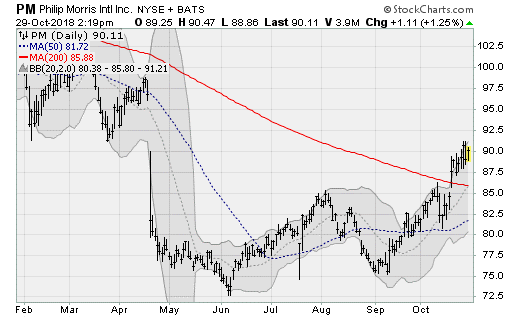 Walmart (NYSE:WMT) stock is breaking higher out of a three-month consolidation, a rare technical picture these days amid so many nasty looking breakdowns especially among technology and financial stocks. Analysts and investors have been bulled up in the wake of a recent investor conference, with TAG highlighting increased confidence in the company’s ability to innovate in areas like automated truck unloading, digital price tags, and new last-mile delivery technologies. The company will next report results on Nov. 15 before the bell. Analysts are looking for earnings of $1.02 per share on revenues of $124.4 billion. When the company last reported on Aug. 16, earnings of $1.29 beat estimates by seven cents per share on a 4.2% rise in revenues. 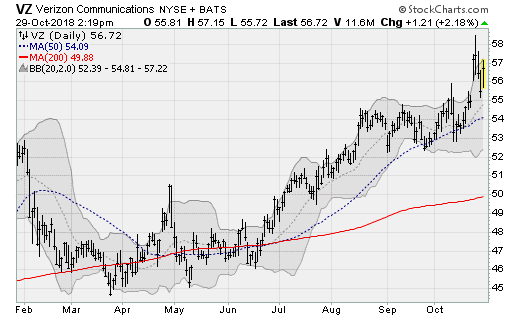 Verizon (NYSE:VZ) stock remains within the confines of a comfortable, multi-month uptrend that started back in June. Despite being sensitive to the movement of interest rates as a dividend-focused stock, shares have benefited from a recent interest in stocks that are less sensitive to the vagaries of the business cycle. 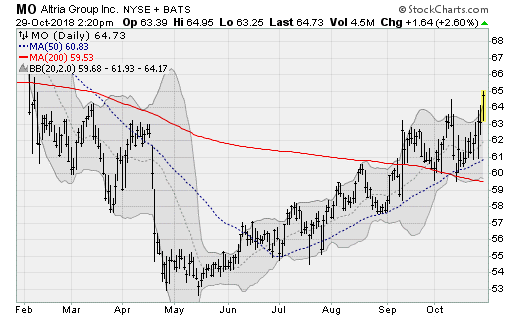 Analysts at Morgan Stanley recently raised their price target to $58 per share, essentially targeting a breakout above the highs set last week. The company will next report results on Jan. 29 before the bell. Analysts are looking at earnings of $1.10 per share on revenues of $34.4 billion. When the company last reported on Oct. 23, earnings of $1.22 per share beat estimates by three cents per share on a 2.8% rise in revenues. Shares of Procter & Gamble (NYSE:PG) gapped higher earlier this month on solid earnings and haven’t really paused for breath, extending an uptrend that started in May (amid a shift away from cyclicals and into defensives) that has resulted in a total trough-to-peak gain of more than 26%. The focus was on a 4% organic sales growth, the best performance since the beginning of 2014 and a sign consumers are splurging on brand-name household goods once more. The company will next report results on Jan. 22 before the bell. Analysts are looking for earnings of $1.20 per share on revenues of $17.1 billion. When the company last reported on Oct. 19 earnings of $1.12 per share beat estimates by three cents on a 0.2% rise in revenues. 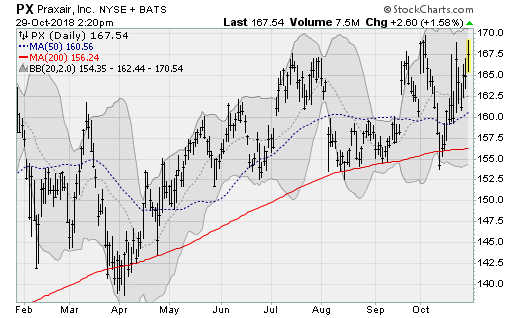 Shares of Pepsi (NYSE:PEP) have scrambled up and out of the lows seen earlier this month, climbing back up and over its 20-day, 50-day, and 200-day moving averages to return to the highs of its post-July trading range. Watch for a breakout above the early August highs setting up a run back towards the record set in January near $120. The company will next report results on Feb. 13 before the bell. Analysts are looking for earnings of $1.50 per share on revenues of $19.5 billion. When the company last reported on Oct. 2, earnings of $1.59 per share beat estimates by two cents on a 1.5% rise in revenues. 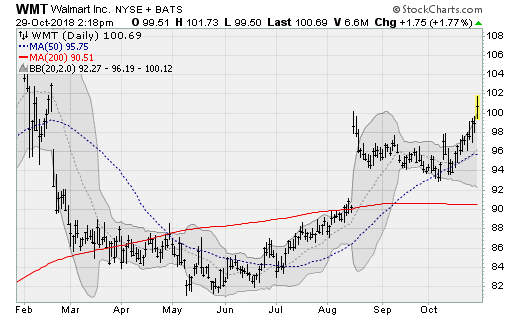 Shares of Philips Morris (NYSE:PM) continues in a steady, professional looking uptrend off of a solid base of support formed between April and September. Already up 20% from the early September lows, shares on the verge of breaking up and out of the downtrend that’s been in place since the summer of 2017. Watch for a return to the highs set earlier this year near $104, which would be worth a gain of more than 15% from here. The company will next report results on Feb. 7 before the bell. Analysts are looking for earnings of $1.23 per share on revenues of $7.5 billion. When results were last reported on October 18, earnings of $1.44 per share beat estimates by 15 cents on a 0 .4% rise in revenues. 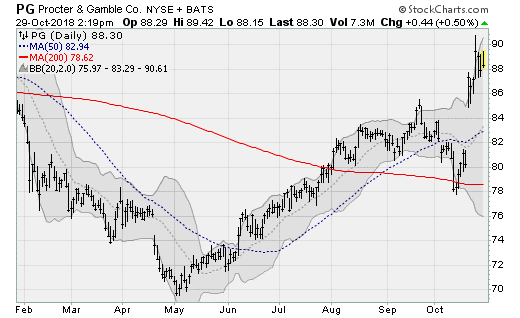 McDonald’s Corporation (NYSE:MCD) stock is enjoying a move up and out of a year-to-date trading range, setting up a push up and over the prior highs set in January. The company recently enjoyed a price target upgrade from analysts at TAG, who are now looking for $195 on improved earnings power and benefits from recent U.S. tax reforms. They also highlight growing free cash flow and the specter of increased capital return to shareholders. The company will next report results on Jan. 29 before the bell. Analysts are looking for earnings of $1.89 per share on revenues of $5.2 billion. When the company last reported on Oct. 23, earnings of $2.10 per share beat estimates by 11 cents despite a 6.7% decline in revenues. 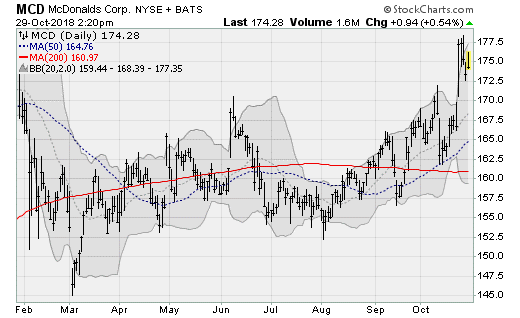 Altria Group (NYSE:MO) stock is breaking up and out of a two-month consolidation range to return to highs not seen since February. That caps a total gain of more than 22% from the lows seen in May. 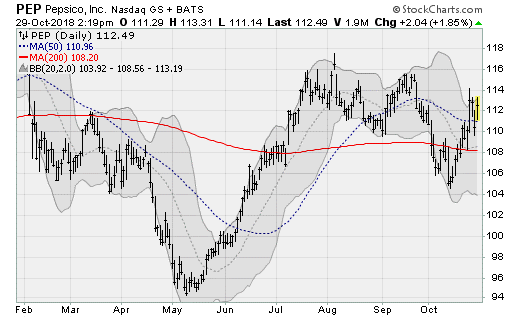 In an environment of concern about the health of the economy, non-cyclical stocks, like tobacco, find favor for their stable revenues. Especially with a growing social pushback against e-cig makers like Juul potentially easing the competitive pressure on traditional cigarettes. The company will next report results on Jan. 31 before the bell. Analysts are looking for earnings of 96 cents per share on revenues of $4.9 billion. When the company last reported on Oct. 25, earnings of $1.08 per share beat estimates by two cents on a 3.3% rise in revenues. 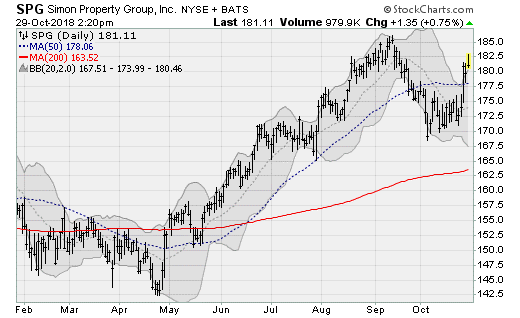 Shares of Simon Property (NYSE:SPG) have rallied back above their 20-day and 50-day moving averages to close in on the prior highs set in September. This after the company reported better-than-expected results and enjoyed an upgrade from JPMorgan analysts earlier this month. A tight labor market and evidence of nascent wage gains are leading expectations of a surge in retail activity, bolstering its portfolio of malls and shopping centers. The company will next report results on Jan. 31 before the bell. Analysts are looking for earnings of $3.25 per share on revenues of $1.4 billion. When the company last reported on Oct. 25 earnings of $3.05 beat estimates by four cents on a 0.4% rise in revenues. Praxair (NYSE:PX) shares are continuing to enjoy a steady base of support from its 200-day moving average, which cradled prices throughout the summer. The stage is now set for a breakout above recent highs near $170 for a push to new records. The company, a provider of industrial gasses such as nitrogen, oxygen, and argon, enjoyed an initiation of coverage from analysts at Exane BNP Paribas earlier this month. Back in July, the company reported better-than-expected earnings of $1.72 per share, beating estimates by two cents on an 8% rise in revenues. 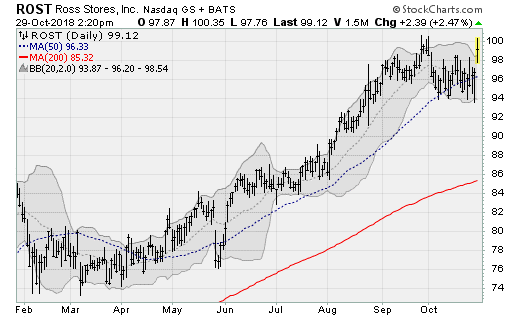 Ross Stores (NASDAQ:ROST) shares are bolting higher, threatening to push up and over the late September high standing in stark contrast to the broad selling that hit markets on Monday. The company recently got an initiation of coverage from DA Davidson analysts in late September, highlighting ongoing tailwinds for off-price retailers amid the secular decline of department and chain stores. The company will next report results on Nov. 20 after the close. Analysts are looking for earnings of 89 cents per share on revenues of $3.5 billion. When the company last reported on Aug. 23, earnings of $1.04 beat estimates by three cents on an 8.9% rise in revenues. Article printed from InvestorPlace Media, https://investorplace.com/2018/10/10-large-cap-stocks-to-buy-leading-the-rebound/.